Expedition 6 takes us to some of Singapore's old haunts! The infamous Mount Pleasant, where tales of strange activities are often. Then off to the Old Seletar Airbase - where tales of haunted and abandoned houses were told, but somehow, the food seems to be the main draw there though, the Sunset Bar and Grill, among the best! And last but not least, we will head towards an old house tipped to us by Agent MaXx, located near the posh neighbourhood of Bukit Timah. What awaits us? find out now! Mount Pleasant is a cemetery started in 1922, as part of the more famous brother cemetery - Bukit Brown Cemetery. Surrounded by tall Angsana trees and tall grasses, it is now a dis-used cemetery but which still house a large variety of Chinese tombs, some amazingly dated back to the late 19th Century. Despites its Chinese flavour, Mount Pleasant is ironically a hotspot for Pontianaks who roam the cemetery freely, flying from tree to tree, letting out scary shrieks as it prays on unsuspecting people who ventured into the forbidden land. It is believed that the lands here, before it was converted into a cemetery, was occupied by Javanese natives, Malay bomohs and superstitious villagers who practiced black magic and spirit worship. Hence the blend of Malay and Chinese. In day time, Mount Pleasant boasts of thick foilage and a lush greenary landscape (picture above taken from http://www.nparks.gov.sg/) and is neighbour to the Former Police Academy. Platoons of police trainee cadets would jog the route of Mount Pleasant for their daily physical training. However, when it turns dark, not a single soul is spotted along this road. Even policemen are known to shun this route whenever they can at night. The entrance to the Mount Pleasant Cemetery is not obvious but near to the junction of Onraet Road, there is a side road that is blocked by a barrier preventing vehicles from entering (see picture below). This is where the cemetery is located. As we started our night investigation, we made several rounds up Mount Pleasant Road before finding the barrier that leads to the cemetery. It has a sign that says that the place is a protected area, but we seriously wonder who in the right frame of mind would dare to stay guard here at night and protect the place? Having ascertained that the coast is clear and having no negative feelings of 'stay clear', we crossed the barrier and walked into the unknown. The path ahead was very dark, and the air was still and quiet. We do not know what lies ahead of us, and paid close attention on the tops of trees to observe any movements and weird sounds of possible Pontianak activity. The path ahead was straight forward and this was probably one of the main paths that led to the cemetery years ago. What is that light that shone ahead of us, some 20 metres away? Although the place was dark and quiet, it was actually pretty calm. We didn feel any sense of danger nor staring eyes. Afterall, our experience in exploring cemeteries told us that usually, places of resting are pretty safe. Somehow, the inner cemetery was also more forlorn and depicts a sadder, almost neglected atmosphere. The tombs were more depleted, the weeds all over and algae more rampant. There was also less structure in the deeper parts of the cemetery, the tombs seem to be scattered around without any proper alignment or pattern. Ocassionally, the trees would move as pockets of drift winds seem to come and go. We stayed closer to each other, but there were no signs of paranormal activities, just natural phenomenon of wind and night. As we walked past each tomb, we took a look at some of them. We wondered what stories these people hold, what past they have led and how their lives were when they were alive. Its amazing how each of them probably represented a whole array of life stories, journey and struggles during their time in this world. Silently, I gave my respects to each of the tombs and prayed for peace for them in the other world. After quite a long walk, we reached what appeared to be a junction of the cemetery, where different paths seem to lead to different parts of the place. This end appeared to be like a storage area, or somewhat represented a 'junk' area. Nearby a makeshift altar was erected. Slightly unusual find in a cemetery to mix higher deities with normal beings. But perhaps it is a sign that deities are being placed here to ward off evil spirits and protect the place from unseen forces. Nearby we saw even more junk, and what appeared to be 2 statues of yellow birds or phoenix. This particular area was dark and the amount of junk that is scattered all over the place presents alot of risk of tripping over unseen things and injuring ourselves. Therefore, we had a quick discusssion and decided that there is probably nothing more worth exploring in this area. In conclusion, Mount Pleasant Cemetery is indeed a place filled with a rich history of stories left behind by many individuals who have passed on. Their tombs and pictures hold an array of hidden stories, some probably will be untold forever. The cemetery, although presents some quiet spots and orbs, was relatively non threatening, unlike the stories of screaming and flying Pontianaks. Maybe the Pontianaks were out that day. But we certainly felt that this place was not haunted, as compared to the many experiences we had in other places. Therefore, we conclude our investigation in Mount Pleasant Cemetery. Seletar Airbase is an iconic and symbolic part of Singapore's aviation history that today still stands strong with much flavours and sights even though it is disused. Located just beside the TPE/SLE at the Jalan Kayu exit, it is now open to public access. Seletar Camp is now a residential, commerical and entertainment hub, home to a host of restaurants including the famous Sunset Bar and Grill, and rows of colonial houses that is still owned by residents aspiring for a laid-back, rustic lifestyle. 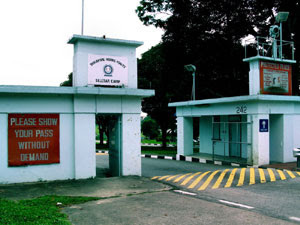 Today Seletar Airbase is occupied by various non military residence that includes art galleries, restaurants, a country club and a cluster of people still living in the premises of the old colonial buildings. Some of the buildings remain unoccupied. Checks with the SLA revealed that some of these empty buildings are still available for public renting and opening bidding prices can range anywhere from $2, 000 to $3, 000 per month. Our investigations take us to explore some of the abandoned buildings in Seletar Airbase. We walked around the area, looking for signs of any abandoned and/or empty buildings. We managed to find a few, but the empty houses were locked. These premises are probably under SLA and they had outsourced to external security companies to overlook these empty houses. We also noticed CCTVs around some of the premises, another sign that it is protected. We were careful not to trespass into areas we were not supposed to explore, so we walked around open areas in search for any signs of paranormal activities. None so far! It was looking kind of uneventful. The whole area emitted a sense of serenity and calm, not one that you will think of spooks or suspense. Some orbs appeared in some of the pictures we took of some of the houses, but nothing much to be excited about except for the dusty atmosphere, considering that there were nearby construction and roads repairing. We chanced upon a row of houses that seemed to be unoccupied called Maida Vale. We wondered what it means. Further checks revealed that Maida Vale is a "residential district in West London between St John's Wood and Kilburn. It is part of the City of Westminster. The area is mostly residential, and mainly affluent, consisting of many large late-Victorian and Edwardian blocks of mansion flats." That explains its English Colonial affluence. Maida is also a kind of flour commonly used in the making of naan and other indian breads! Yummy! Well, this Maida Vale '25' house is neither eventful or yummy, to say the least. Disappointingly we walked on, attempting to see if we can find something out of nothing. All the houses were locked, and even as we peeped into the windows, they were either empty or used to house some stores. The real excitement we got was when we drove to the nearby private jet docking area! There we saw some beautiful private jets and wondered who owned them. Could it be the President? Rumours has it that our Minister Mentor Mr Lee Kuan Yew, owns one jet. Or could it be some rich millionaire businessman? Or maybe even a billionaire? The jets were just left there, without any fences or security, it seems. Well, it makes sense. Who would want to steal a jet plane? how do you even steal it? Well, we decided to end off this investigation as it was turning out pretty uneventful. We all do not feel that Seletar Airbase is haunted. It is just pleasantly filled with rich history and old colonial buildings that resonate harmless soldier spirits of the past more than anything sinister. Following on our rather uneventful exploration of Seletar Airbase, we decided to head on to another rumoured haunted place. There lies an old abandoned house sandwiched between other private housings in the posh neighbourhood of Bukit Timah. This particular house was reported in STOMP, where it is said that a maid that is from the neighbourhood had walked past the abandoned house at night before and heard a lady's weeping/cries coming from the house. Sounds really interesting to have an investigation there! Perhaps we can catch something concrete this time around! As we made our way to the quiet neighbhourhood of Bukit Timah, we could feel the excitement as well as adrenalin pumping. When the house appeared before us, it left us in sheer awe and anticipation. Wow. The house is located just beside the road, up a soft slope. Neighbouring private house littered the surrounding, and it was indeed interesting that this is the only abandoned house along the stretch of road. It seems as if the neighbours weren't even scared or bothered by the strange existence of this house. First impressions of the house as we slowly made our way up the slope towards the side of the house tells us that this house has been abandoned for quite some while. The roof was collapsing, some windows broken, and algae and fungus had already long formed all over the house. The house and its surroundings were also shroulded with overgrown trees and plants, but strangely, the slope and patches of grass around seemed to be trimmed, as you can see from the picture above, as it was not overgrown. Is someone actually 'taking care' of this house? A further closeup of the house and you can witness the algae, dirt and the dilapitated state of this house. The house is made from bricks, suggesting it is not that old, but the mixture of wooden windows as well as olden window grills suggested that this house is probably built somewhere in the late 70s to 80s. We wondered when the house was abandoned and how long it is left vacant. The sheer size of the house also suggests that it is quite a big house occupying a rather big land as compared to the other nearby houses. What could it be used for? Walking from the side of the house, we came to the left tail end of this house, where it seemed like the living room is, as we could see open grills separating the outside from the inside. It is the typical design of the living room. Around the house, we could even see tall thick roots practically coming down from the nearby trees, giving it an even creepier, scarier look. The back of the house looks especially dark and quiet, cetainly looks spooky from here. We walked closer up to the living room grills, and from outside we could see inside clearly, as the grills were transparent. Quite a big hall, but inside was filled with quite alot of rubbish. To the right of the house, we noticed a white bucket, the kind commonly used when contractors are painting or renovating a house. The white bucket gave us the first clue of possibly when the house was left vacant: Someone might have attempted to renovate the house, but somehow the renovation stopped and the equipments were left inside. Could something sinister have caused the renovation to stop abruptly? We took a peep through one of the many opened windows, only to find alot of thrash and rubbish in the inside of the house. But as we explored the perimeter of the house, our suspicion grew even stronger. Lying on one side of the house were layers of wood, nice, unused wood, it looked a little like 'parquet' kind of wood used for flooring, and they were left there! A red bull can lay on top one of the piles of wood. It does point strongly that there is some form of renovation works being prepared for the house, but why it suddenly stopped or for how long it stopped for, and why wasn't the renovation continuing is a great mystery. More mysterious was why it all seemed to stop so suddenly that the contractors didn't even bother to take back their materials and choose to leave it here. Did something really scary happen that made the workers drop everything and run away in fear? Many questions thus far but no answers. We decided to be curious and walk to the darker parts of the house. It was where all the thick vegetation were. And it was really dark. The trees and its leaves blocked out all forms of light. Our eyes concentrated on any moving images or shadows. It is often rumoured that at the darkest and quietest part of any place is a magnet for paranormal activities, as they strived on these places. As I was looking around the thickest, darkest part of the vegetation, both myself and Agent MaxX felt as if there was somebody around, hiding around or just standing from within somewhere, checking us out and looking at us. The feeling of being watched was making us tingle a little. We opened our eyes bigger to see if we can make out anything, but we couldn really see or detect anything visual. Nonetheless we took pictures focusing on the feeling we had where the 'watching' is coming from. And so the picture above. When we reviewed the picture, we seemed to capture what appeared to be a human figure standing in between the trees right smacked middle of the picture. The figure appeared small, indicating that it was possibly a distance away rather than being 'small' in size. Can you spot the figure? A close up of the picture, with slight modifications to the exposure and contrast. Can you spot anything? An even closer picture of the spot where we felt we had captured a human figure. Look closer and you can make up a shape of a figure of someone. The upper body and head is most visible, far away, as if not wanting to take the risk and show us that he or she is there. The outline of the picture above shows where the figure seem to be standing. Look closely and you can make out a person, almost that of quite a fit man, with a white t-shirt and arms at the side. In fact it even seems so clear that you can even spot his fingers on his right hand. Pure coincidence? Just an array of trees and leaves that seem to picture an outline of a man? Well, if it is true, then our feeling of being watched makes sense, as we had felt this feeling but both myself and Agent MaxX feels that this spirit is non-harmful and just quietly watching us from a distance. So that prompted us to carry on our exploring. We went to the other tail end of the house, the opposite side of the area where the living room grills are, and we discovered a mini road covered with sand and dead leaves high enough that it almost engulfed the entire mini road. We concluded that this is the driveway from the main road all the way up to the house. And with this road being quite long, it does seem that owners of the house perferred the long way up and away from the noise and distraction of traffic on the main road. The sheer length of this unusually long driveway also points strongly that this house really seemed quite big and prestigious! In the particular picture above, the roots were so thick that they were as huge as human beings. Strangely, they seem to be growing from some sort of drive way porch that extended out of the house. Already, we were quite awed by the outlook and the foilage that grew around the house. But other than the feeling of being watch, we felt that whatever that was around us were outside, rather than inside. So we continued to look for an opening to enter the house. As we probed around for an entrance to the house, we noticed alot of trash around the perimeter of the house, while the other side were filled with construction stuff, the trash found at this side of the house were more queer. we found a mini gas-like tank, that had begun to rust. Unfortunately we were not able to read the writings as the rust was too much. Anyone out there who is able to give us some clues what this gas tank might be? We didn't want to stay too close, in case it explodes and all of us will become the next group of spirits haunting this house! Walking along, we noticed another weird object on the grass. We really dont know what to make out if it. It looks like an ancient video recorder, some sort of film rolling machine, but it was rigid. So it looked like a decoration than a functional thing. A close up of the weird object we found. Anyone have any clue what it might be? We tried to look around the object for a date of manufacture, but we couldn't find any. This object does fit with the ancient looking door, it looked like its from the same era. When we approach the queer wooden door, I gave it a tuck, and it was unlocked! The rest of the team members stood behind me, as if wondering if the unlocked door meant danger or opportunity. I decided to take a calculated right by swinging the door open and taking a peep inside, while still standing outside. It is also to allow any animals that might be inside (i.e., bats) to come out first before we attempt to enter the premises. Nothing came out. This is a closer shot of how the door looked like. The strange pattern of the door is something you don't quite find these days. Anyone can shed any light as to the type and pattern of the door is characteristic of what kind of door or era it is from? I took a first peep into the house, expecting shadows or some ghostly figure moving inside the house. But none. All was quite peaceful. But junk littered everywhere. The house is a mess. A single sofa stood near the end of the house, and I paid close attention to it, in case i see someone sitting on it. Nothing much. The room was congruent to our outside find that there seem to be some renovation going on, as the same kind of wood pieces were found inside the house, neatly stacked too. A close up to the sofa that we see in the middle of what appear to the a second living room in the house. The roof of the house looked pretty new and modern. Cracks appeared on the wall beneath the roof, and paint was falling apart. This house gave a modern yet old look. Some parts just clashed. The modern roof ceiling certainly clashed with the queer wooden door. What actually happened here? Did a new owner who took over the flat try to renovate the old house, and before completing it all, he decided not to stay here after all? We walked through the first room and discovered the place that we had seen the standing grills from the outside. From inside, it was a pretty nice view looking outside, and a soft breeze was felt coming through the transparent grills. Still more renovation items were spotted. Pieces of wood stacked against the door also showed that some form of tearing down was taking place in the midst of the renovation. More signs of paint dropping, amidst the materials the contractors were about to use but somehow they decide to abandon the items and leave their job. What happened that caused the contractors to leave? Immigration problems? Company closed down? Owner passed away? More questions, no answers. We explored further, trying to find clues to when this place is abandoned. Somewhere near the center of the room, on the ceiling, we noted a strange, old looking light bulb. Somehow the light bulb looked suspicious, somewhat sinister looking. It looked badly rusted and even a little burnt. Could a fire have taken place in this house? At the corner of one side of the room, we noticed a cluster of eggs! It looked like some sort of moth eggs, hanging from the ceiling, looking as if it may fall off! Looked like a scene from Alien or something. For the eggs to be there, we figured out that this place has indeed been abandoned for some while. More items were found on the table in the pantry. Ironically, the table is made up of wood. And wooden pantry tables are rare for modern Singapore. The wooden table made us wonder about the wooden door. Perhaps the 2 things were from the same era! We found paint tins and more renovation items. We are quite sure this place is being renovated. We then zoomed in on the holicks container that we had found. Among the rest, this container looked the best bet to tell us its manufacture date and the expiry date. If there is, it would give us a first clue possibly how long this house has been abandoned. Expiry date is dated year 1993. That means that this place is likely abandoned since or before 1993. That is almost 16 years! Wow. our first concrete clue! We continued exploring the kitchen. There seem to be a storeroom filled with more junk and wood (above), and then a metal sink that is detached from the water pipe. Old square grill like windows tells us that indeed, the architecture of this place seem to fit those in the 80s era. We hypothesized that this house is probably built in the 80s, and undergone renovation somewhere in the early 90s, before it was strangely all abandoned.. This picture looked pretty ordinary, the partitions of the kitchen, wooden drawers and some trash. But what was interesting are the 2 cane-baskets. It just seemed a little out of place, a little strange that amidst the common wooden materials, empty containers and renovation things, 2 cane-baskets lay on the floor. We would certainly freak out if the 2 baskets started floating! Other than the possible clues that allowed us to place a time frame for this house's abandonment, and the initial strange being watched feeling, strange wooden door and funny video like object and the marvellous strange green mushroom, this house is kinda filled more with questions rather than spooks. It is certainly a nice place to explore, as it is open, legal and quite a big place to walk around. The existence of many items makes for the intriguing nature of this exploration! And so, we decided to take another group shot outside this pretty interesting house and it ends Expedition 6! It has been a fun conclusion to the pretty uneventful first part of the expedition. If anyone has any clues to shed on the mysterious objects or possible explanations why the house is abandoned, let us know! Or if any one has any tip off to other haunted places or strange phenomenon or abandoned houses, drop us a message and we shall investigate more! You brave little things! I'm 12 and this expedition is a little bit scary to read. 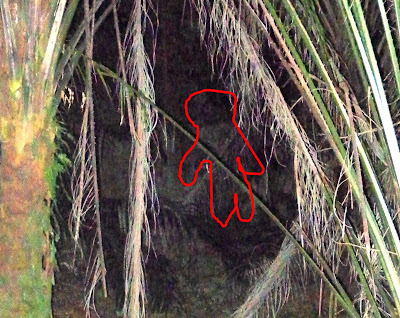 But i did not seem to make out the figure in the trees in the Bukit Timah investigation! Overall , GREAT job on this expedition! The green tank is an aircon refrigerant tank. R22. The 2 round thing nearby, seems to be a car radiator.